Summary: When single father Danny Goodman suddenly finds himself unable to afford the private school his teenage daughter adores, he has no one to turn to for financial support. 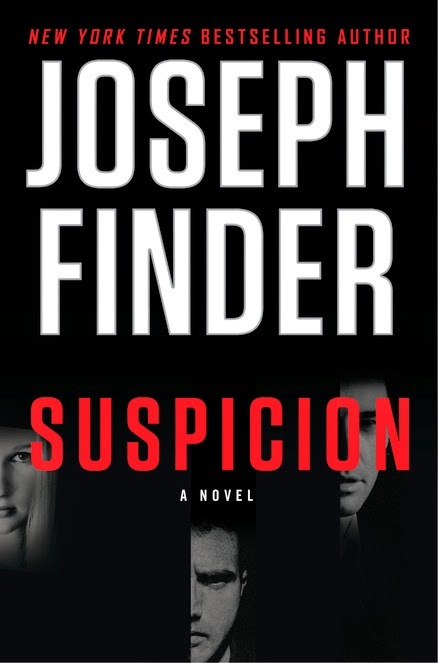 SUSPICION by Joseph Finder opens with main character Danny Goodman in a financial dilemma. Danny, a widower and father of a teen age daughter, finds himself without sufficient funds to cover her tuition at a pricey Boston exclusive girls’ school. In order not to disappoint his daughter, Danny borrows $50,000 from Thomas Gavin, a wealthy Boston money manager and father of his daughter’s best friend. At this point Danny’s life dramatically changes. Danny immediately becomes the target of two DEA agents. He learns that Gavin handles billions of dollars for a ruthless Mexican drug cartel. Danny must decide to co-operate and cope with the risk of the drug cartel finding out or face an indictment for money laundering. Danny decides to cooperate. He’s first task for the DEA is to plant a listening device in Gavin’s office and later he downloads information from Gavin’s phone. Danny finds himself in a constant state of anxiety and having to regularly lie to both his daughter and girlfriend. His assignment is further complicated when he and Gavin become friends. Danny finds the determination to calm himself and devises a plan to end this nightmare and salvage the relationships with his girlfriend and daughter. SUSPICION is a typical thriller where ordinary people are put into heroic situations; there’s plenty of violence and death; and the ending is a surprise after following the mandatory twists and turns. The author does differentiate himself from other thrillers with his strong character development and a well-paced and suspenseful storyline. Although SUSPICION offers nothing particularly unique to the thriller genre, it’s a good page turner that will be enjoyed by anyone who likes a good suspense thriller. It sounds like you both liked this book a lot so I'll have to look for it. I like the Nick Heller series by this author. This one sounds good too.